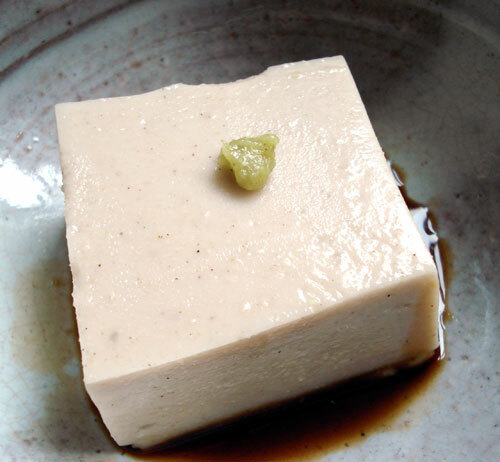 There are some dishes in Japan that look and have a texture like tofu, but are not tofu in the traditional sense; that is, they're not made from coagulated soy milk. One of these not-tofu tofus is goma dofu （ごま豆腐）or sesame tofu. Goma dofu is made from three simple ingredients: ground sesame paste, water, and kuzu or kudzu powder. 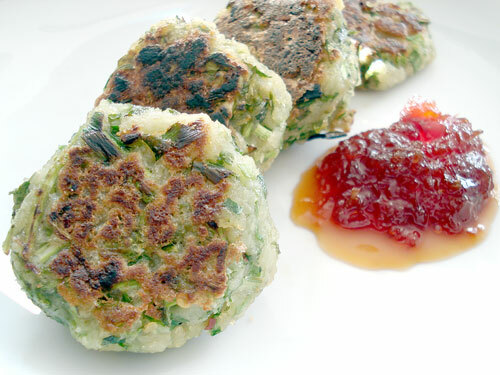 These tasty little savory cakes are made of ground lotus root. 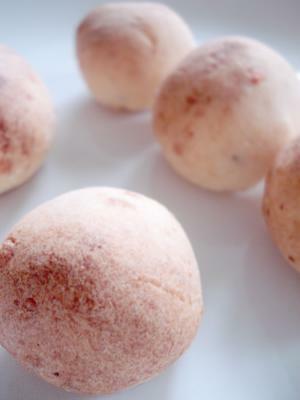 The texture is quite surprising - almost like mochi cakes. It's a great vegan, gluten-free savory snack that's high in fiber and packed with flavor. 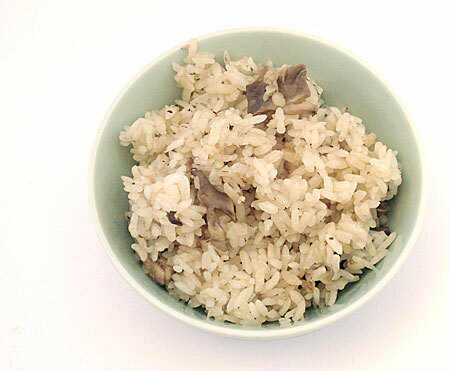 The very first full recipe I posted on Just Hungry almost 4 years ago was Mushroom Rice (kinoko no takikomi gohan), and it still gets a lot of visits and comments, even though there's no photo to whet the reader's appetite or anything. The original recipe called for traditional dashi stock made from bonito (fish) flakes, and suggested adding chicken and other things. This version is a lot simpler to assemble and it's all vegan, but it's just as tasty. And it comes with a photo! (My early photos on the site are pretty awful. I like to think I've learned a little since then.) I am using this in an upcoming bento, but it's good for regular dinner too, so it's posted here. It's actually the best when it's freshly made - the aroma of the mushrooms fills the kitchen, quite irresistible if you love mushrooms as I do. It is a very autumn (fall) kind of dish. I think that this dish reflects my changing tastes and eating habits too, not to mention how I approach writing for Just Hungry, too. 4 years ago, I wasn't that worried about health issues or anything of that nature in regards to food. Now, I am rather proud that I have a tasty dish that is sugar-free, gluten-free (if you use a gluten-free soy sauce), and vegan! I feel a bit trendy. This year we got a bit more serious than usual about our garden, and planted three zucchini plants. If you have a garden with zucchinis, you know that sometime around midsummer they start to produce babies like crazy. We've had a rather cold and rainy summer here up until now, but this week our three innocent looking zucchini plants have gone into high gear, and we're picking them as fast as we can before they turn into seedy, tasteless baseball bat sized monsters. 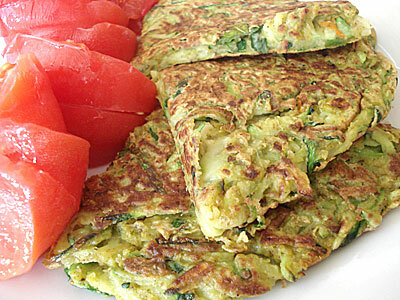 Zucchini pancakes are one way to use up a lot at once. This version uses chickpea flour instead of wheat flour or eggs, with a little bit of spice in it. It's great hot or cold, and is a perfect snack, side dish or complete vegan main dish, since the chickpea flour is such a terrific source of protein and carbs (nutritional info). Serve it with a salsa, curry, or just on its own. Here I just served them with some super-ripe tomato wedges. The shredded zucchini adds moisture and a rather creamy texture, which I love. Chickpea flour is used in Mediterranean and Indian cooking. I get mine from a local Indian grocery store, where it's sold as gram flour; it's also known as besan, ceci flour, and so on. Seamaiden, who has a lovely gluten-free blog called Book of Yum, asked in the comments here whether Ajinomoto is gluten-free. Since I know that a lot of people become interested in rice-centric Asian cuisines, including Japanese, because of the wide variety of wheat-free dishes, I thought I'd post some of my findings here about Ajinomoto and dashi stock granules rather than bury them in the comments. Monosodium glutamate or MSG is a concentrated and manufactured form of umami. It is a flavor enhancer with a lot of controversy. I won't get into that at the moment, since reactions to MSG really vary widely depending on the individual. The reality is that MSG is present in many manufactured food products. We're starting to see asparagus at reasonable prices again in the stores, which I'm really happy about. The ones available now come from California and Mexico, so they aren't very food-miles-correct, but I still can't resist buying a bunch or two. In a few weeks we'll start seeing asparagus from a a bit closer places like Spain and France, not to mention fat white asparagus from Germany. This is aspagarus with a ground sesame sauce, which would be called aemono (as explained in the broccoli ae recipe) if made with white sesame seeds, but since this version is made with black sesame seeds it's called gomayogoshi, or "dirtied with sesame". 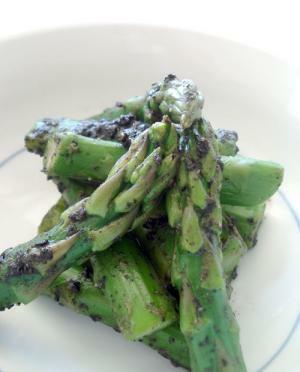 I don't think it looks dirty - I really like the contrast of the bright green asparagus with the black sesame sauce. You can, of course, use regular white (brown) sesame seeds instead, in which case it would be called asparagasu no goma ae. The sweet nutty sauce compliments the asparagus quite well. I've included step by step instructions for grinding sesame seeds in a suribachi. You can grind up the sesame seeds in a plain mortar and pestle instead. You may be able to buy pre-ground sesame (surigoma), though that isn't nearly as fragrant as freshly ground sesame. It makes a great side dish, as well as being great for your bento box. All hail the mighty broccoli. While it's always available in the produce section, it's one of the few fresh vegetables that haven't been shipped halfway around the world to reach people who live in many parts of the northern hemisphere during the colder months. In the spring we even get very locally grown broccoli and its relatives like romanesco. 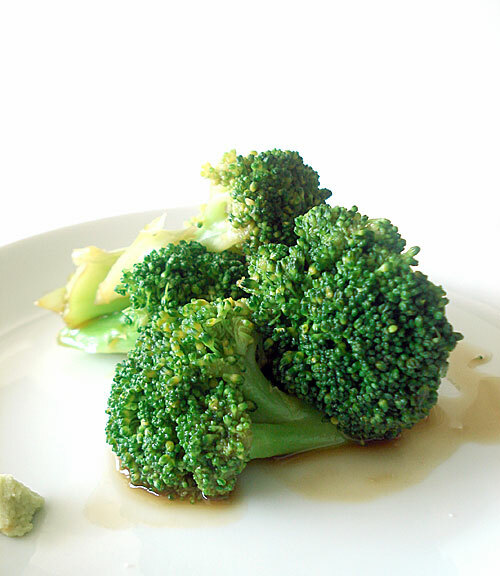 Broccoli can be rather boring if it's just served steamed, boiled or, god forbid , raw. (I'm sorry, I don't really get raw broccoli. Raw cauliflower yes, but not raw broccoli.) A way to perk up broccoli without relying on those yummy yet caloric additions like mayonnaise, cheese sauce or garlic-and-olive-oil, is to make aemono or ohitashi with them. Ohitashi is basically vegetables that have been steamed or blanched/boiled served with a sauce that contains soy sauce, often but not always a little dashi stock, and sometimes a bit of sake or mirin and sugar. Aemono uses a similar sauce, with added ingredients like ground up sesame seeds. In this recipe, the sauce contains wasabi, so it's aemono. As long as you have all the ingredients on hand it's very quick to make, and very tasty. The sinus-clearing qualities of the wasabi are softened by the other ingredients in the sauce, while still giving the broccoli a nice, bright flavor. It makes a great side dish as part of a Japanese meal, or even a salad. 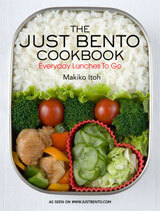 It's also a very nice bento item (you may want to contain the sauce in a paper cup or its own container). This may not be well known outside of the two respective countries, but there are pretty strong historical and cultural ties between Japan and Brazil. There was a wave of emigration from Japan to Brazil in the early part of the 20th century and later on around the '50s and '60s. And in the last 30 years, many Brazilians of Japanese descent (people of Japanese descent born in another country are called nikkei-jin) have in turn emigrated to Japan to fill labor shortages. Perhaps because of this, a few years ago one of the staples of the Brazilian diet, pao de queijo, little cheese breads, became very popular. While their popularity may have descended a bit from their peaks (Japan tends to be periodically swept up by big food or fashion trends, which after a time get dropped without warning when people move onto the next thing, but that's another story), they are still made by bakers throughout Japan. I think that pao de queijo appeals so much to the Japanese palate because they are small, round and cute, and have a distinctive gooey-sticky-glutinous kind of texture inside. 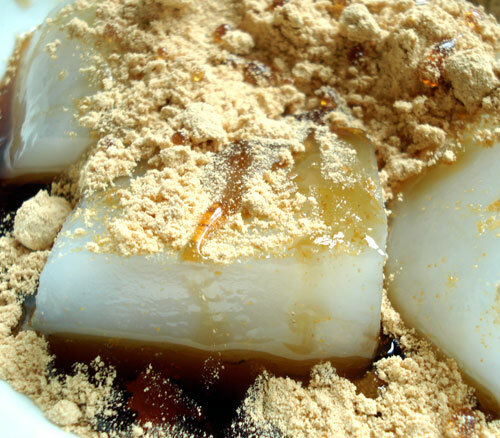 This texture is called mochi mochi, after mochi, the very gooey-glutinous rice cakes.